Lilya Dances | Family friendly entertainment for all occasions. Family friendly entertainment for all occasions. Lilya started bellydancing in 1998, and has studied with numerous teachers in England, Boston and San Francisco. She made the transition to performing in 2002, and has danced at many of the restaurants and clubs in Boston and San Francisco, as well as at dozens of private parties. Her style has been influenced by all her teachers, but she is primarily an American Cabaret style belly dancer who enjoys playing the zills while balancing swords or a tray of flaming candles on her head. In 2013 Lilya began taking SharQui dance fitness classes, and she became a certified SharQui instructor in 2014. Want to burn up to 350 calories an hour doing something you love? Come try out a Sharqui class! Sharqui is a belly dance-based workout good for all skill levels - even those who have never tried belly dance before! Please wear comfortable clothing and bring a hip scarf if you have one (there will be loaners available as well!). Cost: First class free! After that, $15 per class; 5 class card for $60. Email Lilya at lilya@lilyadances.com to register. Drop ins welcome! 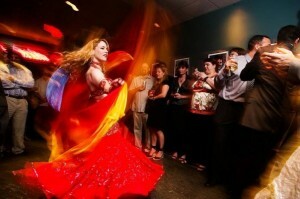 Lilya loves performing at weddings, birthday parties, corporate events, and bachelorette parties. She does not perform at all-male gatherings. There are several difference performance options, and Lilya is always happy to work with you to design the best show possible. short 10-15 minute show perfect for surprising the guest of honor at a birthday party. This includes 3-4 songs and one prop (sword or tray of candles). The guest of honor will be encouraged to join Lilya on the dance floor at the end. Prices start at $150. This is a great option if Lilya will have a stage on which to perform and the guests would enjoy a longer show (for example, while they are eating dinner). This set typically includes five or six songs, and Lilya will perform with a veil as well as one other prop. Prices start at $200. Lilya will teach an hour long class to you and your friends, focusing on a short and simple choreography. Lilya will bring hip scarves for everyone to wear during the class and will leave a scarf with the guest of honor when the class is over. Prices start at $150. A popular choice for bachelorette parties and bridal showers! Lilya will perform a quick 7-10 minute set and then teach an hour long lesson. She'll bring hip scarves for participants to borrow during the lesson, and will leave a hip scarf with the guest of honor so she can keep on dancing! Prices start at $200. Upcoming shows and classes:Wednesdays 7-8pm (ongoing): Sharqui class at Raq-On Dance Studio in White River Junction (behind the Main St. Museum). Sharqui is a belly dance-based workout good for all skill levels - even those who have never tried belly dance before. Please wear comfortable clothing and bring a hip scarf if you have one (there will be loaners available as well!). The first class is free!